A/Prof. Al Muderis is an Orthopaedic surgeon specialising in hip and knee joint replacement, arthroscopic, reconstructive surgery and minimally invasive surgery. He is also Chairman of the Osseointegration Group of Australia. The Osseointegration Group of Australia provides those with both above-the-knee and below-the-knee amputations with a leg replacement using the OGAP-OPL Prosthesis which is designed to be as close to the human anatomy as possible. Our head office is located in Norwest Private Hospital (Bella Vista). We also have practices at Drummoyne, Sydney Adventist Hospital and Macquarie University Hospital. To make an appointment, contact our secretarial staff .You will be given the earliest possible time available at your choice of location. If you have specific requests you are more than welcome to talk directly with A/Prof Al Muderis' personal assistant. She will ensure your request is answered appropriately. Please note, we always have available space in our clinics for urgent matters that cannot wait till the next available appointment. 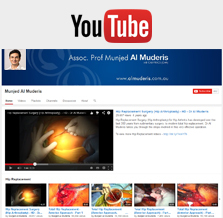 If you need to see A/Prof Al Muderis urgently please ask to speak directly to A/Prof Al Muderis' personal assistant. We offer comprehensive assessment and treatment of musculoskeletal conditions using best evidence based medicine. A/Prof Al Muderis has particular interest in hip, knee and trauma surgery. If your condition is outside of A/Prof Al Muderis’ experience and interest he will arrange for you to be treated by the most appropriate specialist in the area of your pathology within the group. Our website contains comprehensive educational material for a wide range of viewers including patients and health care professionals. In order to provide complete, high quality and efficient service to our patients, we are co-located with radiology, pathology and physiotherapy services at each of our locations. Our staff will give you all the information you need regarding costs, such as consultation fees. If surgery is needed, Ms Belinda Bosley will take you through the whole process, from completing the necessary forms, providing a cost estimate for surgery and assisting with any queries you may have. Though this can be a confusing area, Ms Bosley is very experienced and is more than capable in making the process as simple as possible. Our standard fee charges are based around the Australian Medical Association recommended fee.